You can find an index of all the GURPS bibliographies we have online here. If you spot any broken links or other problems with this page, please report them to webmaster@sjgames.com. The Renaissance is a well-documented, much-studied era, and Florence is one of the most examined places of the period. Consequently, there is a great deal of literature on the subject. These are some of the more important and accessible works used when writing this book. Acidini, Cristina, and Garratt, Kate. Treasures of Florence: The Medici Collection 1400-1700 (Prestel, 1997). In addition to illustrating the art and precious possessions of Firenze's most powerful family, this could be used to illustrate treasures for fantasy European-flavored campaigns. Hale, John Rigby. 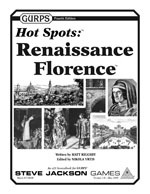 Florence and the Medici (Phoenix Press, 2001). A history of the Medici dynasty, with particular attention to their relationship with the city of Firenze. Hibbert, Christopher. Florence: The Biography of a City (Penguin, 1994). A general and quite accessible history of Firenze's political and artistic history from its foundation into the 20th century. A good first book on the subject. King, Ross. Brunelleschi's Dome: How a Renaissance Genius Reinvented Architecture (Penguin, 2001). A brief, fast-moving account of the politics and logistics around the completion of the Duomo at the dawn of a period of remarkable artistic and intellectual creativity. Levey, Michael. Florence: A Portrait (Harvard University Press, 1998). A history of Firenze from the Renaissance onward, mostly told in the context of the history of its arts and architecture. Lucas-Dubreton, J. Daily Life in Florence in the Time of the Medici (Macmillan, 1961). Accounts of diet, dress, and popular culture in early Renaissance Firenze. Mallett, Michael. Mercenaries and Their Masters: Warfare in Renaissance Italy (Rowman and Littlefield, 1994). One of the more comprehensive sources on the subject, covering the 14th and 15th centuries. Mattingly, Garrett. Renaissance Diplomacy (Dover, 1988). Currently the definitive work on the subject. A large part deals with Italian innovations in diplomatic practice, with much of the remainder discussing on how well or poorly the rest of Europe learned the Italian lessons. Martines, Lauro. 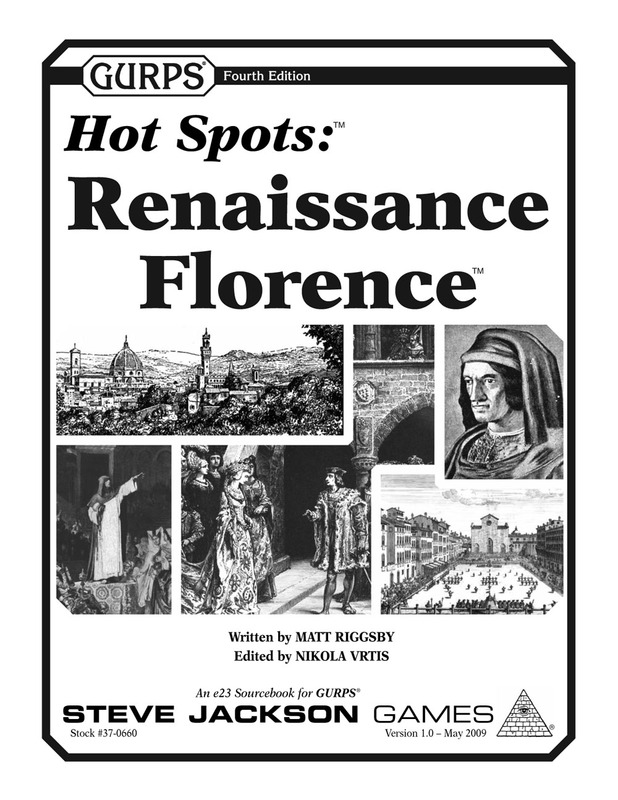 April Blood: Florence and the Plot Against the Medici (Oxford University Press, 2003). An extremely detailed but easily read account of the Pazzi's failed attempt to assassinate Lorenzo de Medici. Could be used as a textbook on how real-world conspiracies, which typically involve delicate alliances and unreliable participants rather than all-knowing puppetmasters, actually work. Martines, Lauro. Fire in the City: Savonarola and the Struggle for the Soul of Renaissance Florence (Oxford University Press, 2006). An outstanding biography of Savonarola, applying Martines' eye for detail and engaging style to a slightly later period than April Blood. Martines, Lauro. Power and Imagination: City-States in Renaissance Italy (Johns Hopkins University Press, 1988). A somewhat advanced, though nonspecialist, history of the Renaissance, highlighting the relationship between the interests of urban social elites and the rise of humanism and Renaissance artwork. Muccini, Ugo (Lisa Pelletti, translator). Palazzo Vecchio: Guide to the Building, the Apartments, and the Collections (Scala, 1989). An architectural history of the Palazzo della Signoria. Includes detailed floor plans. de Roover, Raymond. Rise and Decline of the Medici Bank (Harvard University Press, 1968). A specialist work, but it sets out in great detail the scale and operations of Renaissance banking and commerce in general. Turnbull, Steven. The Art of Renaissance Warfare: From the Fall of Constantinople to the Thirty Years War (Greenhill, 2006). Less focused on Italy than Mercenaries and Their Masters, but more accessible both physically and in its subject matter. These translations are mostly recent print editions. However, all are freely available on-line in a variety of older translations that have fallen into the public domain. Alighieri, Dante (John Ciardi, translator). The Divine Comedy (Norton, 1977). Not a Renaissance work, but very popular during the Renaissance, particularly in Dante's hometown. Ciardi is just one in a series of notable poets (including, for example, Longfellow) who have translated Dante, and he created one of the more accessible modern versions. Ariosto, Lodovico (Guido Waldman, translator). Orlando Furioso (Oxford University Press, 1999). This popular epic, written by a poet attached to the Medici court, is a distant ancestor of the modern fantasy novel and might give some idea of what a Renaissance fantasy roleplaying campaign might have included. Castiglione, Baldassare (Thomas Hoby, translator). The Book of the Courtier (Kessinger, 2007). Castiglione wasn't Florentine, but his book redefined nobility for the Renaissance, claiming education, elegance, and refinement as the most important properties of a nobleman rather than just military prowess. This book gives some idea of how an upper-class Florentine, or any upper-class Italian, might have thought. Machiavelli, Niccolò (Harvey Mansfield, translator). The Prince (University of Chicago Press, 1988). This bedrock work of political philosophy is often mentioned but rarely read, and is far less wicked than its critics would claim. Vasari, Giorgio (Julia Conway Bondanella and Peter Bondanella, translators). Lives of the Artists. (Oxford University Press, 2008). One of the first works to describe the lives of artists, and certainly the first of its magnitude. Roessner, Michaela. The Stars Dispose (Tor, 1998). A fantasy story, along with its sequel The Stars Compel, about an apprentice growing up on the fringes of the later Medici court, with Catherine de Medici as a prominent character. The descriptions of food are particularly plentiful and well-written. Yarbro, Chelsea Quinn. Ariosto (Tor, 1980). Another fantasy Florence, this one shifting between the poet Ariosto's artistic struggles and his character Orlando's adventures. Yarbro has used Florence as a setting for other books, such as the historical vampire novel The Palace. Concord Ensemble. Trionfo d'Amore e della Morte (Dorian Recordings, 2003). Contains music written by musicians active around Florence specifically for the Medici. Dufay, Guillaume. Chant & Motets: The Virgin & the Temple (Pomerium, 1997). Dufay was Flemish, but he wrote an important motet (on this recording) commissioned to celebrate the completion of the Duomo. da Firenze, Paolo. Narcisso Speculando: Madrigals of Paolo da Firenze (Harmonia Mundi, 2002). Paolo's music spans the end of the Middle Ages and the beginning of the Renaissance, setting the stage for the music that will develop later. Huelgas Ensemble. In Morte di Madonna Laura (Sony, 1991). The selections on this recording, written through the Renaissance, are based on the works of Petrarch, a Tuscan and one of the grandfathers of the Renaissance. O'Dette, Paul. Dolcissima et Amorosa: Early Italian Renaissance Lute Music (Harmonia Mundi, 1994). In addition to being very good, if rather delicate, music, O'Dette is one of the better lutenists of his generation.